Guangzhoushi Yin Yu Printing Material Co. Ltd.
Guangzhou Yinyu Printing Material Co., Ltd. Flying Sublimation Printing Material Co., Ltd.
Short on time? Let offset-ink sellers contact you. 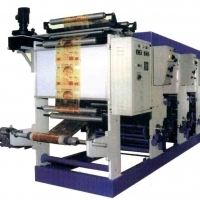 FLYINGFO-GRSublimation Offset Inkwas designed for offset printing.t wasused on all kinds offset printing machine such as single-color , dual-color and multi-color offset printing machine .Be adaptable to the demand for medium-speed or high-speed printing. Product Description 1) This sublimation inks safe for the environmeand has no harm to skin . It does not belong to corrosives, totally environmentally-friendly.2) There is no accumulation of inkon the rolls and the number ofmachine washings is greatlyreduced. Ink granula is less than 5um.3) All colors are very intense and gives good coverage. Excellent color reproduction, with high printing performance and outcome. Strong dye degree and excellent transfer ability.4) Have no skinning within 36 hours in ink-box and no crust in 7 days at normal temperature, save 20% ink when printing.5) Good ink-water balance. Good sun-proof performance and high light fastness. Transferred pattern washable, no peeling, no fading and good weather resistance. Meilianxing (Shenzhen) Tech. Co., Ltd. Advantage:1.High brightness and excellent adhesive.2.Fasting drying without any blocking or misting.3.Abrasion resistance and scratch resistance.4.High printing effect with small amount ink.5.Suitable for water offset and waterless offset printing.6.Sgs certificate with rohs approveen71-3, svhc169, chpa, phthalate 17p.7.Compatible to most led uv dryer system Technical data :1.Led uv lamp wavelength: 385-395nm.2.Led uv power> 3, 000 mj /cã?¡( by ls 128 uv energy meter).3.Viscosity: 120000±20000cps.4.Printing method: lithographic offset printing machine and narrow web presses.5.Application rangalcohol and tobacco packagingdaily chemical products packagingelectronic products packaging, food packaging , album of painting, label sticker etc. Offset ink flow meter Porter:sales9@gnflowmeter.com Site:www.microflowmeter.com Skype:shcixi_ru Offset ink flow meter(mini oil water flow meter) principle is a liquid pushing one pair of oval gears; volume of each cavity is a fixed volume; gear speed leads, the sensor sends the sync pulse count, oval gear rotated by the magnetic seal coupling and reduction gear mechanism passed directly to the counter indicates the total flow through the meter. If the additional transmission means, the display of offset ink flow emter together with electrical instrument can achieve remote only instantaneous flow or accumulated flow. The offset ink flow meter with 0.2% accuracy and low flow range.the high temperature is 200C,the max pressure is 1000Bar.the output is pulse and material is stainless steel and aluminum. Model	Flow range	Connection CX-M2-SS/AL	0.5~150 ml/min	G1/8 female thread CX-M3-SS/AL	1-300 ml/min	G1/8 female thread CX-M5-SS/AL	5-1000 ml/min	G1/8 female thread CX-M6-SS/AL	0.5-100 l/H	G1/4 female thread CX-M9-SS/AL	5-550 l/H	G1/4 female thread CX-M12-SS/AL	1~30 L/min	G1/2 female thread CX-M25-SS/AL	5-110 l/min	G1 female thread CX-M40-SS/AL	10-250L/min	G1 1/2 female thread CX-M50-SS/AL	10-500L/min	G2 female thread Select the JSN and select the offset ink flow meter,we will provide the professional service for you. 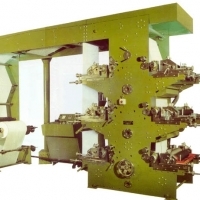 ROTOGRAVURE PRINTING MACHINE Salient Features: Heavy Duty M.S.Plate frame. Best quality electronic devices. Vibration free running. Ease of Operation. Highly precise printing quality. High speed Registration accuracy. Stainless steel pipes, stainless steel pipe fittings, stainless steel wires, copper wire, copper strips, copper rods, ERW black and galvanized steel pipes, flanges, auto parts ( cylinder liners, cylinder heads, pistons, piston rings, engine valves), fasteners, hoses, light industrial machinery.